You’ve become interested in using a menstrual product that is healthier for the environment and for your body. You are considering or already made the switch to washable cloth pads. But what about choosing a washing detergent to clean your cloth pads? It should be effective, but it should also not be harmful for your body and our environment, right?! 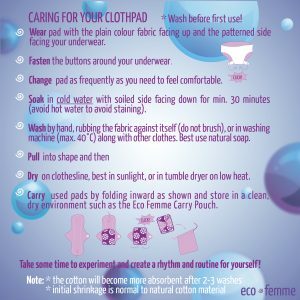 In this blog series “How to wash my cloth pad?”, in PART 1: washing routine for cloth pads we shared a step by step washing instruction and some extra tips. Now in PART 2: Choosing a Soap, we discuss using a soap that is safe for your body and the environment…and how important that choice really is. Next in PART 3: The Cloth-Pad-Soap we will introduce a soap made by our friends at MGEcoduties. Our customers frequently ask us what soap to use to wash our cloth pads. We generally recommend a natural, organic soap. Why is that? The answer is straightforward: We have designed a menstrual product with care for your health and the environment in mind; using organic cotton and offering an alternative to sanitary products with harmful toxins. Evidently, the products for washing your cloth pads ideally follow the same focus: not harm your body and not harm the environment. Soap cleans, so it is “clean”, isn’t it? Let’s take a look at what “clean” actually means. Have you ever asked yourself what is actually inside your soaps, shampoos and washing detergents, Dettol, Surf Excel, Ariel, Henko and stain removers like Oxy-Action or Oxy-Clean, Vanish, etc., which are advertised in the media with happy faces for the “clean” results they produce? Most of us have probably never researched the possible environmental and health effects of listed ingredients, such as parabens, phosphates, phthalates, sodium lauryl sulphate, formaldehyde, synthetic fragrances, colours, stabilizers, preservatives, microplastics, palm oil, etc. Manufacturing companies that use harmful ingredients produce toxic wastewater. Many cleaning products come in plastic packaging that ends up as waste. We ourselves produce wastewater every day when we use washing detergents, soaps and shampoos to clean our clothes, bodies and households! Harmful soap residues stay on the item we wash, even after rinsing! How can something become “clean”, which we “clean” with that? The chemicals and packaging end up in our streets, landfills, water, rivers, oceans, plants, animals, our food and ultimately our own bodies. When we use these kinds of “cleaning” products to wash ourselves, our clothes and our living spaces, are we really “cleaning” here? Foam is what we see in advertisements and what we associate with cleaning since our childhoods. We might feel that bubbles prove the effectiveness of a soap. However, this is a misconception: There is no link between the amount of foam a product generates and how well it cleans. Products can contain added foaming agents to enhance the emotional “consumer experience” of cleaning, but that have no actual cleansing benefit. In fact, the more a product foams, the more water is needed to remove all soap residues and rinse the foam off our clothes, our bodies and household surfaces. 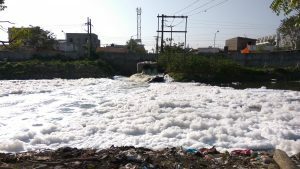 Through this, large amounts of clean water are wasted and dumped down the drain…along with the “cleaning” foam. Bottom line: We don’t need all that foam. We can save time, water and the environment by making the switch to low foaming natural cleaning products. Your product choice is not just about preventing toxic wastewater. It is also about the substances you get in touch with directly. Your hands will touch the soap while washing. Well…and we are speaking about sanitary pads which have direct contact with your skin: This is also about possible residues in the cloth after washing. Taking care of the sensitive skin in your genital area was probably one of your reasons to make the switch to cloth pads, away from disposables, and to avoid the possible health effects of harmful chemicals. 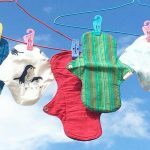 The genital skin is especially sensitive to absorbing toxins, as we discussed in our blog article Disposable Pads & Tampons…A Ticking Time Bomb? 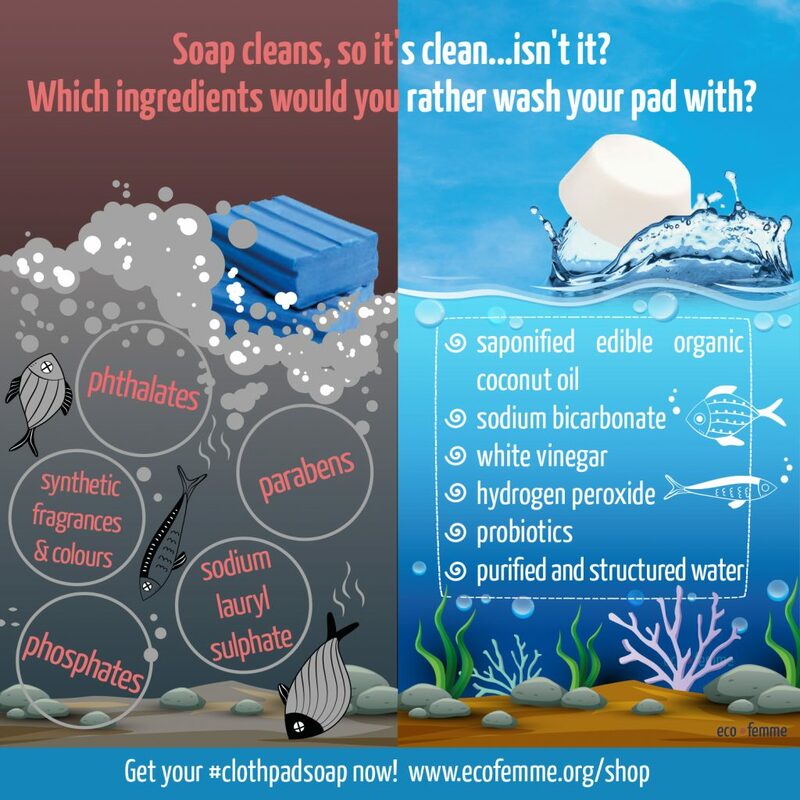 So then: It makes plain sense to also use a soap that doesn’t contain harmful substances! Since YOU are the one who is going to have to make the healthy and sustainable choice, you can do some research to get to know natural organic soaps and see what is available where you live. Coming up in PART 3: The Cloth-Pad-Soap made by PROBIOTICS HOUSE.